We left Perth and moved to Aberdeenshire in 2004. It seems like a lifetime ago. Back then, Perth was a prosperous market town and the locals tended to look down on it’s city neighbour along the Tay. Many of the locals still look down on Dundee, but living as we do now between the two cities, having moved back in the summer, we see things a bit differently. We’re drawn to Dundee rather than Perth most weekends. For retail and leisure, not to mention culture, Dundee wins hands down. The wonderful DCA, Dundee Rep, the McManus Galleries, the University and DJCAD. I could go on. We lived in Dundee in the late ’80s, indeed Rebecca was born there. In those days Dundee was still a manufacturing-led city, although that was dying. It had yet to re-invent itself and no-one could have foresaw the computer games & drug discovery industries that would replace manufacturing. It’s like a different city now . The City of Culture bid is creating a buzz about the place, but you feel that even if the bid isn’t successful the regeneration will go on. The city has embraced it’s creative heart and allowed it to flourish. Initiatives like Creative Dundee, Vanilla Ink and the We Dundee project are incredibly exciting and have me babbling about how great it is to be back. But – yes there’s a but – my gut tells me I shouldn’t be feeling like this. You see, I grew up in Perth. Well, Scone to be honest, but near enough. My mum & dad met at a dance in the city hall. I went to school there (Perth Academy) and met my wife Joanna at a disco at the Wheel Inn in Scone, September 1986. Back in the days when I played golf I was Perth Boys Champion and represented Perth & Kinross. I used to be a youth coach at St Johnstone Football Club. The city is a huge part of my life, of who I am. And yet it feels like I’m disowning it. Dundee’s better, so we’ll just go there. But you don’t change things by dong that. I’m a Perth boy and I love the place. Yes, it’s not the City that it once was, but that’s all history. All that matters now is what lies ahead. Indeed, there are parallels with the journey of re-discovery that Dundee was forced down. If you look at things differently, Perth actually has a lot going for it. It’s a hub for tourism, and a wonderful golfing county – the Ryder Cup is coming here next year. There’s the magnificent Horsecross Concert Hall, the theatre (which is about to undergo a major redevelopment), the Festival of the Arts. There’s a creative heart in this city too, but we don’t shout about it. Recently I’ve met with Enterprise North East Trust, who operate the Business Gateway in Tayside & Angus, and do you know what? Perthshire accounts for the lions share of startups each year in Tayside. That surprised me. I also spoke with the local council economic development team and they’re doing some great things to encourage business growth and entrepreneurship including next month’s Business & Enterprise Month. 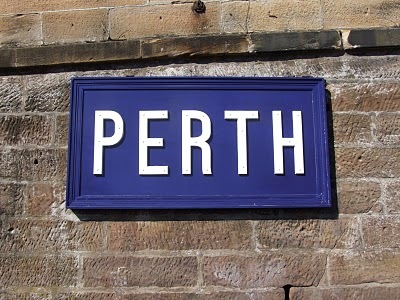 I’ve started following Perth folk and organisations on twitter. There’s a good core there of people who care and who are doing amazing things in the city they love. It’s just doesn’t seem at all joined up to me. Plus people spend too much time looking back. Yes, it’s not the city it was a decade or two ago, but so what? We can either look back and get depressed, or we can look forward and imagine what the future might be. Let’s make it a city to be proud of for the next generation. A City of Opportunity to rival the City of Discovery. I’m up for it, who wants to join me? Previous Post Splosh at the Tosh!